does shana think shes riding a horse with that arm movent. Well, the pile-o'-peat is confirmed. It looks like a breakdown of two large groups, depending on flight?ferry?. Some of the caps with Donald (dirty face from loading the peat), the Hsus, etc., show bad weather (I know, the weather can change fast). Survivor is over back to TAR! Good call Slowhatch!! 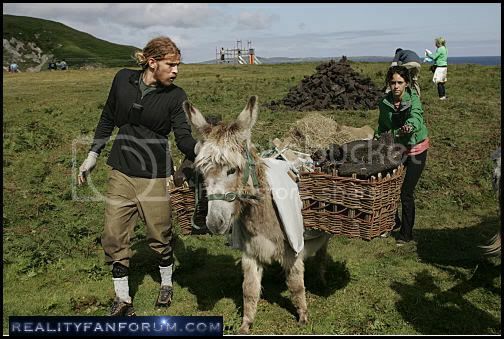 You can clearly see the RB set up behind the donkeys so RB then Donkeys where do the bikes come in? Jenn & Nate on bikes then with the donkey. They have to ride the bikes to the RB? Maybe no detour option just RB EP1? That fourth shot down is a great shot--It has the peat, the zippy Bike line, the cluebox, AND a nice view of the shoreline! Come on you GE people--I KNOW you can find this! Are those other teams in the background or just production/randoms? 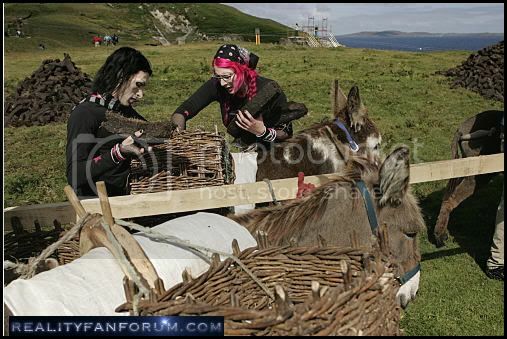 Well I might be able to come up with a donkey but a Goth smiley? I dunno ? A commercial thanks to ROB when ready but I'm not sure which one it is. Maybe the Aran Island Ferry is just that? Just a pretty introflash? OR not ? I have to organize these pictures! Or maybe the Aran island ferry in this case doesn't go to the Aran's? I wonder if the high-wire, death-defying task is actually a ROADBLOCK? or just a task all teams must perform. I don't recall an actual Roadblock in any previous ep one. Correct me, please if I am wrong. 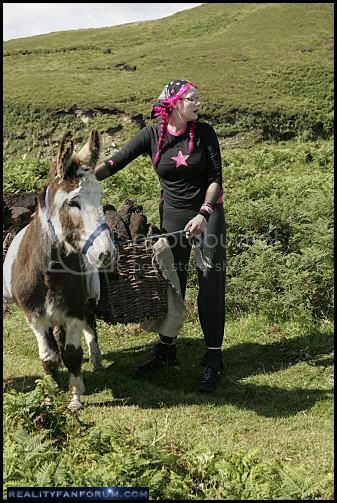 If this is indeed a DETOUR, then it looks like Nathan and Jennifer and Ari and Staella started off with the Donkey and then changed and tried the bike task. 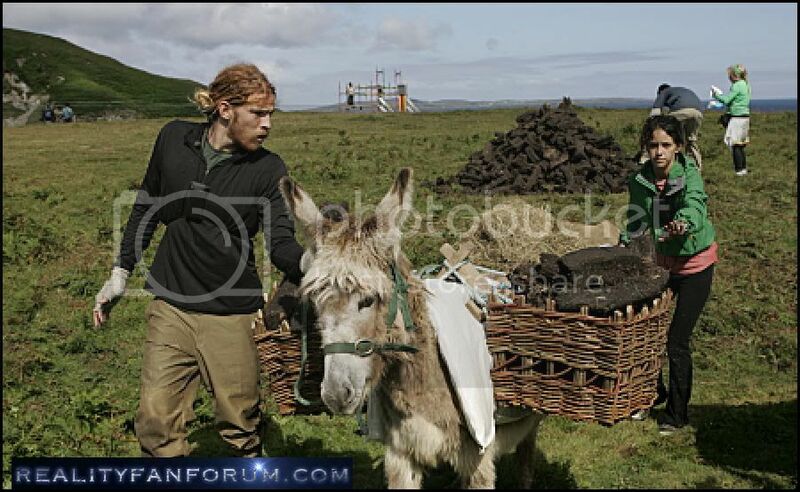 But we now have Kynt and Vyxsin doing both tasks so it looks both Bike and Donkey tasks must be done by all teams. And these two tasks must overlap since we see Jason and Lorena riding on the bike passing Ari and Staella pushing the Donkey up the trail. puddin thanks for the photos that is amazing!! and on a second look it might not be the pitstop because Ron & Christina are at it so nevermind! Well the two ferries DRAíOCHT NA FARRAIGE and and the sister ship CEOL NA FARRAIGE are apparently custom jobs, so I doubt there's any lookalikes anywhere else in Ireland. So we're stuck with the Arans. Thats not such a bad thing Slowhatch ! Hey check this out! I say the Ministers are safe! What's in the background? A road? A lake maybe? No dice this time, peach. The Aran Islands are, as they say, in the "fuzzies" on Google Earth. The low resolution images really don't help much. Looks like the "Tar detectives" need to use some old fashion "elbow grease" to solve this. Do I detect some "second thoughts" about Aran Islands? Oh yee of little faith. You're folding like a house of cards. You got till the 4th, plenty of time to tie up the loose ends. For me, I need a drink. If you have realplayer beta you can go to CBS and download the promo its pretty clear. Azaria Azene and Hendekea Azene/ Brother & Sister --- last of the final 7?- -- out in --Dubrovnik ? My guess~ Marianna Ruiz and Julia Ruiz but have now changed to Ari and Staella but am not sure either way. puddin, coming out of Dubrovnik, there can be only 6 teams left unless a TBC was used (which I doubt in one of the first 6 legs). If all the teams in the top 2 categories make it, there are no slots left. Going into Taipei there are 4 teams left unless a TBC was used. I have to correct myself. 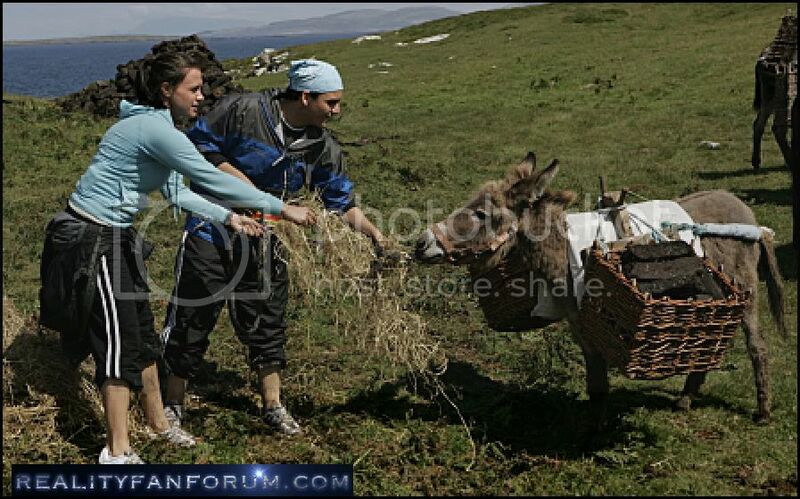 Upon further review, it now appears that CBEss has done some fancy digital editing and added in the shot of Ari and Staella and their donkey into the background of Jason and Lorena riding their bike. So the two tasks DO NOT OVERLAP. The shot of Nathan and Jennifer embracing must come at some later time: She has exchanged her green bandana for a red one. Also in the BG of the teams loading up the donkeys, the structure in the background is part of the death-defying high-wire bike stunt, but is it the landing area or the takeoff area? It doesn't seem to match the area seen in shots of Nathan and Jennifer and the Goths landing. But the clue box is there by gum. this is work in progress --I am still working on it. I have album upon album to sort through. Good work, wench of mine. But you could also add the shot of the Aer Lingus plane taking off. So it looks like speculation of two groups could be possible. One on Aer Lingus, the other on British Air.